If you need blanching equipment for your food processing, we offer a high quality vegetable blanching machine with a cooler. We can also provide heat treatment and blanching with low water consumption. This machine is for blanching the products. This is a machine used for heat treatment of vegetables. This is a machine used for heat treatment of vegetables (excluding leaf ones) and mushrooms before their freezing or preparation of preserves from them. A raw material is evenly spread on the belt. Spreading is provided by the vibratory conveyor that is the integral part of the machine. Blanching occurs as a result of hot water spraying and the appropriately selected belt speed. After blanching, the raw material is subject to water and air cooling by spraying water mist and its suction off by the set of fans. The sucked off air is directly removed outside the building by the extraction systems. That cooling method ensures maximum savings in water consumption in the machine. 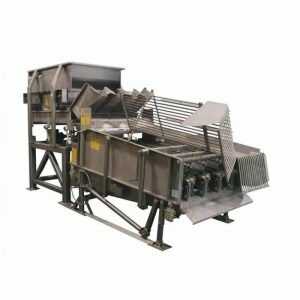 The product is collected by the flat belt conveyor that is the integral part of the machine. The control system enables the process parameters (water temperature, blanching and cooling time, water consumption etc…) to be selected and monitored). Hot water for blanching is heated by the direct injection of steam into the blancher tub chamber. Water is also heated in the blancher distribution section. The machine enables blanching in three options: 1.with hot water, 2. with steam, and 3. with mixture of steam and hot water.